Background: Metformin is the first-line oral anti-diabetic drug and Nigella sativa (NS) have been used as traditional medicine to cure/prevent a wide range of diseases in different part of the world, particularly in Saudi Arabia. Objective: To carry out the comparative biochemical and histopathological studies on the efficacy of metformin, Nigella sativa oil (NSO) against thioacetamide (TAA)-induced acute hepatorenal damage in rats. Materials and Methods: Forty-eight male Albino Wistar rats were randomly divided in to eight groups with six rats in each group. Group-I (normal control): received normal saline (1 ml/kg, p.o. ), group II (toxic control): received normal saline (1 ml/kg, p.o.) and TAA (500 mg/kg, i.p. ), group-III (NSO per se): NSO (2 ml/kg, p.o. ), group IV (metformin per se): metformin (250 mg/kg/d, p.o. ), group V (NSO+TAA): NSO (2 ml/kg/d p.o. )+TAA (500 mg/kg, i.p. ): group VI (metformin+TAA): metformin (250 mg/kg/d, p.o.) +TAA (500 mg/kg, i.p.). Group VII (NSO+metformin +TAA): NSO (2 ml/kg, p.o. ), and metformin (250 mg/kg/d, p.o. )+TAA (500 mg/kg, i.p. ), group VIII (TAA+Jigreen): jigreen (1 ml/kg/d, p.o. )+TAA (500 mg/kg, i.p.). Normal saline, NSO, metformin and jigreen were administered to respective groups by gastric intubation for 7 consecutive days. On the 7th d, 1 h after the drugs treatment, a single intraperitoneal injection of TAA (500 mg/kg,) was administered to the rats of all groups except groups I, III and IV to induce acute liver and kidney injury. All animals were sacrificed under ether anesthesia after 24 h of TAA administration. The liver and kidney function tests in the serum were evaluated to assess the toxic effects of TAA as well as the protective effects of the given treatments against TAA induced the hepatorenal toxicity. Histopathology of liver and kidney tissues was also carried out to validate the findings of biochemical investigation. Results: The results indicated that the TAA intoxicated rats showed significant increase in the alanine transaminase (ALT), aspartate transaminase (AST), gamma-glutamyl transpeptidase (GGT), alkaline phosphatase (ALP), lipid profile, uric acid, urea, creatinine, while no significant changes were observed in serum levels of calcium, magnesium and phosphorus as compared with normal control rats. In the treatment groups, combination drug therapy showed remarkable alleviation of hepatorenal toxicity in metformin plus NSO group and was congruent to that of the standard polyherbal preparation “jigreen”. The histopathological studies also support the hepatorenal protective effects of metformin and NSO. Conclusion: The results of the study demonstrated that metformin+NSO protects liver and kidney against acute TAA toxicity. Overall, this study proved the ameliorative effects of metformin, NSO and metformin plus NSO combination against TAA induced hepatorenal toxicity in rats. Metformin, Nigella sativa oil, Thioacetamide, Hepatorenal toxicity, Liver, Kidney. Liver, one of the vital organs and the largest gland of human body, is principally responsible for regulating the metabolism and detoxification of unwanted endogenous or exogenous substances by eliminating and/or excreting. Liver has one of the most crucial roles in maintaining the homeostasis via metabolism and detoxification of drugs and hence any deviation in its primary functioning may ensue serious health problems in humans as well as in animals. Since, the time of industrial revolution, the entire ecosystem has been victimized by the intensive biological magnification. The large-scale use of industrial chemicals, multidimensional pollution, irrational use of drugs and/or self-medications along with their side effects have caused severe health issues globally, including but not limited to hepatotoxicity or liver dysfunctions. Moreover, evolution of fatal diseases and use of therapeutic drugs have lent hands in further deteriorating the human health issues. For instance, anti-tubercular drugs such as rifampicin, isoniazid and overuse of commonly used analgesics and antipyretics have been observed to cause dose dependent hepatotoxicity . The occurrences of hepatotoxicity by mentioned chemicals and drugs are the most common type of iatrogenic disease and this condition of liver toxicity is further exacerbated by the absence of specific and reliable treatment . Rate of morbidity and mortality due to hepatotoxicity or chronic liver disorders is tremendously on the rise which makes it a major health problem throughout the world posing a big challenge to health care professionals, drug regulatory agencies and pharmaceutical industry to find an adequate suitable treatment . Thioacetamide (TAA), a potent centrilobular hepatotoxic agent classified as carcinogen of class 2B, is frequently used in the experimental models of chemically induced hepatotoxicity in rodents. TAA exposure results into acute as well as chronic hepatic damage by interfering DNA, RNA, protein synthesis, and gamma glutamyl transpeptidase activity . It causes acute liver toxicity by interfering the transfer of RNA to cytoplasm from the nucleus, and hence instigating a membrane injury. Basically, microsomal CYP2E1 converts TAA via two steps to "thioacetamide-s-oxide or sulfoxide" and then to a bioactive metabolite thioacetamide-S, S-dioxide which acts as a direct hepatotoxicant and causes centrilobular necrosis . TAA decreases the number of viable hepatic cells and oxygen utilization rate. It is also reported to be responsible for reduction of bile volume and its contents like cholic acid, deoxycholic acid and bile salts. Hepatorenal toxicity has also been reported by subcutaneous administration of TAA at a dose of 100 mg/kg. TAA induced cirrhosis in animals is very much like human cirrhosis . TAA causes increase in intracellular calcium concentration, alters permeability of cell, karyomegaly and mitochondria inhibition which ultimately results into hepatic cellular death. The leakage of cellular enzymes from liver cells into plasma is marker of liver injury . Additionally, TAA also causes damage to the kidney, brain, stomach, intestine, spleen and lungs. Increased level of serum uric acid, urea and creatinine are marker of the impairment in kidney functions and kidney toxicities . Metformin (a dimethyl biguanide) is most frequently prescribed oral anti-diabetic drug in type-2 diabetes. Metformin exerts its anti-hyperglycemic effects by multiple mechanisms of action, including inhibition of glucose production in the liver. Several studies have reported the hepato-protective effects of metformin. In a recent study, metformin pre-treatment was found to mitigate the acetaminophen induced hepatotoxicity in mice, via Gadd45β (growth arrest and DNA damage-inducible 45 beta)-dependent JNK (c-Jun-N-terminal kinase) regulation . The exposure to hepatotoxic agents causes mitochondrial oxidative stress and necrosis of hepatic cells. Since, metformin is known to possess antioxidant effect, it diminishes the oxidative stress and necrosis of hepatocytes. Additionally, metformin has been known to possess, anti-inflammatory potential via suppression of pro-inflammatory cytokines production, and hence suppresses hepatic inflammation . On the other hand, the mechanism of anti-inflammatory activity of metformin in not well established, however, some published studies assume that metformin possibly decreases the inflammation by binding and inhibiting the extra-cellular activity of endogenous protein “high mobility group box 1 (HMGB1)”. HMGB1, released from the damaged cells, is termed as “alarmins” and is supposed to be responsible for the inflammation. The serum level of HMGB1 is found to be increased in conditions like acute liver failure, sepsis, traumatic injury and myocardial infarction . Some other beneficial pharmacological properties of metformin have been reported such as anticancer, anti-hyperlipidemic, cardio-protective, nephroprotective, hepato-protective and anti-obesity activity. All these activities are assumed to be based on its antioxidant and antiinflammatory potentials. The potential uses of metformin includes diabetes mellitus (type 1), gestational diabetes (fetal exposure), lactation failure (new-born exposure), pancreatic beta-cell rest in new onset diabetes mellitus (type 2), cancer (leukemia and solid tumors), weight gain (with antipsychotic use), brain injury (due to stroke or radiation therapy), and Duchenne muscular dystrophy . Several studies have reported the protective effects of metformin against different chemicals and drugs induced hepatotoxicity in experimental animals. In one of the study, metformin was found to ameliorate methotrexate (MTX) induced hepatotoxicity in rabbits. This alleviation was attributed to the antiinflammatory, antioxidant and anti-apoptotic potentials of metformin . It was also reported in another study that metformin modulated cisplatin induced liver injury in rats by alleviating oxidative stress and decreasing the mitogenactivated protein kinase (MAPK) and caspase-3 activities along with decreased nuclear factor-kappa B (NF-κB) level . In a similar study, Du et al. reported that metformin (350 mg/kg) protected acetaminophen (400 mg/kg) induced hepatotoxicity in mice by alleviation of mitochondrial oxidative stress and mitochondrial dysfunction . 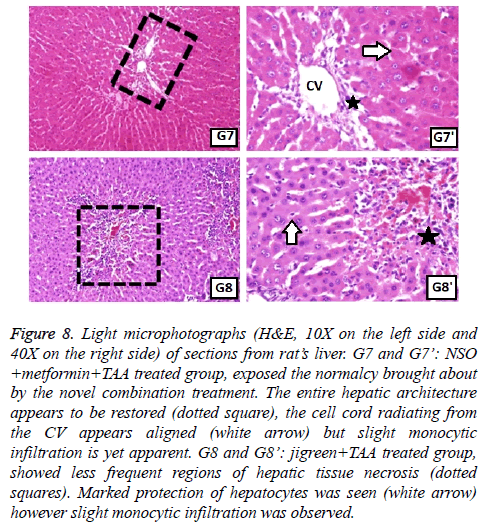 Metformin has also been reported to treat ethanol induced hepatotoxicity in rats in a dose dependent manner and hence it might be useful intervention in the ethanol-associated liver toxicity . Contrastingly, according to reports, metformin has been rarely associated with hepatotoxicity as its adverse drug reaction. However, some contrary case reports have also been published, claiming occurrences of liver toxicity in some diabetic patients clinically treated with metformin. Hashmi reported a case report of metformin induced liver toxicity in a 44-y-old obese female type 2 diabetic patient. She was diagnosed with subclinical liver injury one month after beginning the use of metformin. Liver function tests of this patient confirmed mixed pattern of liver damage. Consequently, metformin was stopped immediately, and it was noticed that increased level of alanine aminotransferase (738 U/l) was neutralized within a few days . Nigella sativa, also known as black cumin in English, and Habat-ul-Sauda or Habbat-ul-Barakah (seed of blessing) in Arabic, belongs to Ranunculaceae family. In Islamic mythology, Nigella sativa is quite significant drug and is seen as a universal treatment for every ailment. The daily consumption of black seeds has been recommended in Tibb-e-Nabwi for prophylactic and therapeutic use . Since centuries, it has been traditionally used as, including but not restricted to, analgesic, anti-diarrheal, appetite stimulant, anti-microbial, antihypertensive, digestive, diuretic, liver tonic, and in skin diseases. It has been revealed by numerous research studies that N. sativa possesses broad spectrum pharmacological properties such as antioxidant, antimicrobial, anti-diabetic, analgesic, anti-inflammatory, anticancer, antihypertensive, anti-oxytocic, anticonvulsant, bronchodilator, diuretics, gastro-protective, hepatoprotective, immunomodulatory, pulmonary-protective, renal protective, spasmolytic properties, etc. N. sativa has received special attention and is currently one of the top ranking research priorities of evidence based herbal medicines which is primarily due to its amazing potential of healing [19-22]. The hepatoprotective potential of N. sativa seed oil was reported against different animal's models of hepatotoxicity. The immunological and hepatoprotective properties of N. sativa seed oil was recently published . Jigreen is a polyherbal formulation widely used in India for optimizing liver function and removal of toxins from liver. Formulation was developed by Hamdard Wakf laboratory of Unani medicines, New Delhi, and it was clinically tested for different liver disorder including hepatitis. “Jigreen®” contains various strong hepatoprotective active ingredients like Cichorium intybus , Tamarix gallica , Solanum nigrum , Rubia cordifolia  and Rheum emodi . All these ingredients individually showed hepatoprotective activity. Combination of these hepatoprotective drugs showed synergistic effect and utilized for the treatment of liver disorder. Hence, in current study, we experimentally established efficacy of synthetic drug metformin along with Nigella sativa oil in liver and kidney disorder in comparison with standard reference to marketed polyherbal formulation “jigreen” based on our previous research work [1,6,29,30]. The absence of satisfactory and adequate number of appropriate drugs for prevention and treatment of liver and renal disorders worsens the disease. Therefore, there is an urgent need of developing effective natural and synthetic drugs for the prevention and treatment of liver and kidney diseases. Based on the studies reported for N. sativa seeds possessing numerous therapeutic effects and on the reports of prophetic traditions that N. sativa seeds cure all diseases except death , this study was designed to carry out its comparative study along with metformin which also has diverse medicinal properties and is widely used in the management of chronic type-2 diabetes apart from several beneficial effects ranging from antitumor effect, anti-aging effect, cardiovascular protective effect, and Neuro-protective effect etc. . 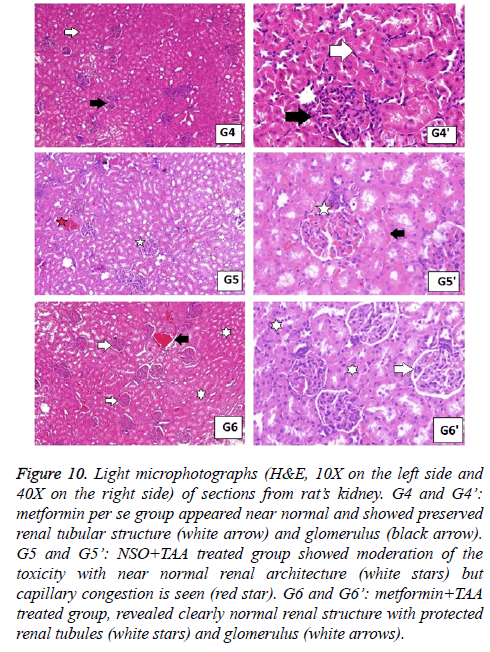 Hence, in this research, possibility of synergistic effects of N. sativa and metformin against TAA induced hepato-renal toxicity in male Wistar rats was studied. Thioacetamide (TAA) was procured from Sigma-Aldrich Corp., St. Louis, MO, USA. TAA was administered as a single intra-peritoneal injection (500 mg/kg, b.w.) to induce acute hepato-renal toxicity in rats . The NSO was purchased from the local market of Jeddah. Metformin (glucophage-500 mg) was purchased from the local pharmacy. The tablets were crushed and powdered in a pestle mortar. The metformin powder was suspended in distilled water. The standard hepato-protective drug “Jigreen®” was procured from Hamdard (Wakf) laboratories, New Delhi, India. The NSO, metformin and jigreen were administered to rats of respective groups by oral gavage as per dosing schedule outlined in the experimental design. The rest of the chemicals used in this experimental study were pure and of analytical grade. Healthy male Wistar Albino rats (100-200 g) were taken from the animal facility of King Fahad Medical Research Centre, King Abdulaziz University-Jeddah, Saudi Arabia and the study was carried out as per the institutional guidelines on animal care. Before the commencement of the dosing, all the rats were acclimatized under standard conditions of 12 h’ light and dark cycle at 25 ± 2°C and 55 ± 5% of relative humidity for the adaptation of lab conditions. The rats were fed with standard pellet diet and water ad libitum was provided throughout the study. Composition of standard pellet diet which was fed to the rats contained corn, pulp of soybean, seeds of sunflower, molasses, meat-bone meal, marble dust, vitamins and minerals. The composition of nutrients was crude protein (23%), crude fat (3%), crude fiber (7%), acid insoluble ash (8%), calcium (1%-2.5%), phosphorus (0.9%), sodium (0.5%-1%) and moisture (12%). Albino Wistar rats (male) 48 in number, were selected and randomly segregated into eight groups with six animals in each. A single intra-peritoneal injection of TAA (500 mg/kg, b.w.) in the form of 2% w/v solution was given to all animals in groups II and V to group VIII on the seventh day to induce acute hepatorenal toxicity. Group I (normal control: NC): Rats were given normal saline (0.9%) w/v (1 ml, p.o.) for seven consecutive days and received free access of standard pellet diet and water ad libitum for seven days. Group II (toxic control: TC): Rats were given normal saline (0.9%) w/v (1 ml, p.o.) for seven consecutive days. On the 7th d, the animals were intoxicated by giving intra-peritoneal injection of TAA (500 mg/kg) to induce acute liver and kidney injury. Group III (NSO per se): NSO (2 ml/kg, p.o.) was administered for seven consecutive days to check the per se effect of NSO. Group IV (metformin per se): metformin (250 mg/kg/d, p.o.) was administered by gastric intubation for seven consecutive days to check the per se effect of metformin. Group V (NSO+TAA): NSO (2 ml/kg, p.o.) was administered for seven consecutive days. On the 7th d, one hour after the NSO administration, the animals were also intoxicated by intra-peritoneal injection of TAA (500 mg/kg) to induce acute liver and kidney injury. Group VI (metformin+TAA): Metformin (250 mg/kg/d, p.o.) was administered by gastric intubation for seven consecutive days to check the protective effect of metformin. On the 7th d, one hour after the metformin administration, the animals were also intoxicated by giving intra-peritoneal injection of TAA (500 mg/kg) to induce acute liver and kidney injury. Group VII (NSO+metformin+TAA): Both NSO (2 ml/kg, p.o.) and metformin (250 mg/kg/d, p.o.) were administered by gastric intubation for seven consecutive days, on the 7th d, 1 h after the drugs treatments, the animals were also intoxicated by giving intra-peritoneal injection of TAA (500 mg/kg) to induce acute liver and kidney injury. Group VIII (jigreen+TAA): Standard polyherbal marketed preparation jigreen (1 ml/kg, p.o.) was orally administered for seven consecutive days. On the 7th d, 1 h after the drugs treatment, the animals were intoxicated by giving intra-peritoneal injection of TAA (500 mg/kg) to induce acute liver and kidney injury. All animals were fasted overnight at the termination of the study and then sacrificed on 8th d, after 24 h of TAA injection. The blood was directly withdrawn into centrifuge tubes from retro-orbital plexus under light ether anesthesia. The collected blood was kept aside at room temperature to clot for 30 min. The clotted blood was then centrifuged (3000 rpm for 10 min) to obtain the clear serum and the supernatant was transferred into aliquots and kept at -80°C for biochemical investigations. Liver and kidney tissues were isolated by dissection of each rat and kept in 10% formalin solution after cleaning with normal saline. These preserved tissues were used for histopathological investigations. The biochemical parameters of liver function tests were assessed by measuring serum level of aspartate transaminase (AST), alanine transaminase (ALT), AST/ALT ratio, gamma-glutamyl transpeptidase (GGT), alkaline phosphatase (ALP), total bilirubin (TB) and direct bilirubin (mg/dL) were studied in different groups. The serum levels of triglycerides (TG), total cholesterol (TC), high density lipoprotein (HDL-C), low density lipoprotein (LDL-C) were analysed to assess the lipid profile in different studied groups. Kidney function tests were assessed by measuring serum level of uric acid, urea, creatinine, calcium, magnesium and phosphorus in different studied groups. All the above tests were estimated using commercial diagnostic kits (Cayman Chemical and BioVision Incorporation, USA) with the help of an auto analyzer (Chemistry Analyzer (CA 2005), B4B Diagnostic Division, China). Histopathological assessment of liver and kidney tissues were carried out as per the standard method to check the histopathological changes. Small pieces of both liver and kidney tissues from all groups were immediately transferred and fixed in 10% formalin for 24 h. The sections (4-5 mm thick) of both liver and kidney tissues were prepared. These sections were properly stained using Hematoxylin-Eosin (H&E) dye. The microphotograph of stained sections of both liver and kidneys were investigated for expected pathological alterations in hepatic and renal tissues. The data were analysed using the statistical package for social science (V.20, Chicago, USA). All the results were expressed in terms of mean ± standard deviation (SD). Statistical comparisons were carried out using the one-way analysis of variance (ANOVA) test followed by post hoc least significant difference (LSD) multi group comparison. Homogeneity of variance was assessed using the one-way ANOVA test and Levene’s statistic test. For all tests, a probability (P<0.05) was considered significant. The effect of various treatments was insinuated by evaluating various parameters of liver function as described in Figures 1 and 2. Due to the hepatotoxicity induced by TAA, more than 2 times rise in the serum levels of AST (348.7 U/L), ALT (250.58 IU/L), total bilirubin (0.38 mg/dl), direct bilirubin (0.23 mg/dl) and GGT (55 U/L) was seen in the disease control group as compared to the NC (p<0.001 for every parameter); however, serum level of these parameters remained same in the NSO only and Met only groups, and were equivalent to the NC but considerably lower than that of the disease control group (p<0.001 for every parameter). Figure 1: The changes in the levels of AST, ALT, ALP and the ratio of AST/ALT in various groups. Group I: normal control (NC), group II: toxic control ((TC)-TAA), group III: NSO per se (NSO), group IV: metformin per se (Met), group V: (NSO+TAA), group VI: metformin +TAA (Met+TAA), group VII: NSO+metformin+TAA (NSO+Met +TAA), group VIII: jigreen+TAA (Jigreen (std. drug)). Values are expressed as mean ± SD (n=6). Groups as compared to NC: a(p<0.05), b(p<0.01), c(p<0.001); groups as compared to toxic control p(p<0.05), q(p<0.01), r(p<0.001). 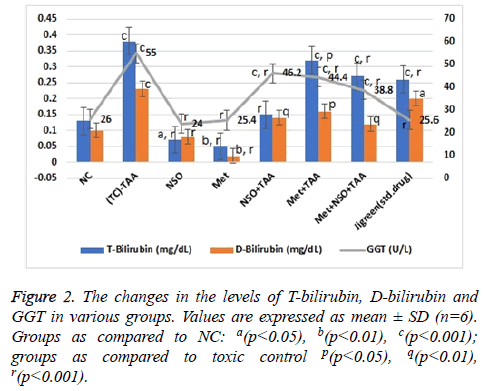 Figure 2: The changes in the levels of T-bilirubin, D-bilirubin and GGT in various groups. Values are expressed as mean ± SD (n=6). Groups as compared to NC: a(p<0.05), b(p<0.01), c(p<0.001); groups as compared to toxic control p(p<0.05), q(p<0.01), r(p<0.001). In the mono-drug treatment groups NSO+TAA and Met+TAA, the serum level of all these parameters; AST (247.3 and 239.95 U/L), ALT (175.84 and 163.66 U/L), total bilirubin (0.15 and 0.32 mg/dl), direct bilirubin (0.14 and 0.16 mg/dl) and GGT (46.2 and 44.4 U/L), were restituting mildly towards the NC and disease control group (p<0.001 for every parameter); however maximum recovery was seen in the combination drug treatment group i.e., Met+NSO+TAA. As evidently seen in Figures 1 and 2, the serum level in the Met+NSO+TAA group was almost congruent to the standard drug treatment group. The ratio of AST/ALT showed sigmoidal variation stretching from NC to the standard drug treatment group. It was almost similar in the NC (1.98) and standard drug treatment group (2.07), with only small deviation in the novel combinational treatment group, Met+NSO+TAA (1.61) as seen in Figure 1. These results implicate a significant outcome of the current study in the alleviation of hepatotoxicity induced by TAA. The induction of toxicity in liver noticeably raised the serum levels of triglycerides, total cholesterol and low-density lipoproteins (p<0.001 for every parameter), while decreasing that of the high-density lipoproteins significantly (p<0.001 for every parameter) as compared to the NC group (Figure 3). In the mono-drug treatment groups NSO+TAA and Met+TAA, the serum level of all these parameters was no different than NC and but was almost half than that of the disease control group (p<0.001 for every parameter). On the other hand, near normal results were observed in the combination drug treatment group i.e., Met+NSO+TAA. As evidently seen in Figure 3, levels of all the lipid parameters in the Met+NSO+TAA group was in equivalence to the jigreen treatment group. The data analysis of lipid parameters indicates that the N. sativa in combination with metformin may prove to be a novel treatment for hepatorenal toxicity. 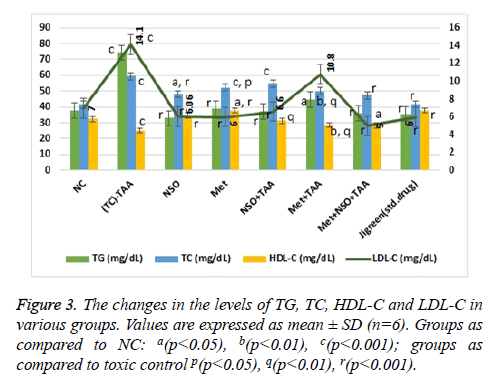 Figure 3: The changes in the levels of TG, TC, HDL-C and LDL-C in various groups. Values are expressed as mean ± SD (n=6). Groups as compared to NC: a(p<0.05), b(p<0.01), c(p<0.001); groups as compared to toxic control p(p<0.05), q(p<0.01), r(p<0.001). As seen in Figure 4, the level of urea was significantly (p<0.001) increased in the toxic control group (44.92 mg/dL) as compared to the NC (32.98 mg/dL). Urea levels were same in mono drug treatment groups; NSO only (26.38 mg/dL) and Met only treated (29.32 mg/dL) and were slightly less than that in the NC group; whereas the results in combination treatment group Met+NSO+TAA (32.82 mg/dL) was astonishingly similar to the NC group and significantly (p<0.001) different from the toxic control. A similar pattern was noticed (Figure 4) for the serum levels of uric acid, with an exception that the combination treatment group showed better results than the standard treatment drug i.e., jigreen and hence this was articulate in establishing renal protective characteristic of this combination therapy. Variation in the levels of creatinine was also analysed and it was inferred that changes in the serum level was non-significant as evident from Figure 4. Figure 4: The changes in the levels of UA, creatinine and urea in various groups. Values are expressed as mean ± SD (n=6). Groups as compared to NC: a(p<0.05), b(p<0.01), c(p<0.001); groups as compared to toxic control p(p<0.05), q(p<0.01), r(p<0.001). With the induction of renal toxicity, the serum levels of Ca2+, Mg2+ and PO43- ions, slashed minutely (non-significantly) in the toxic control group as compared to the NC (Figure 5). The lowest level of inorganic PO43- ions with significant variation as compared to the NC (p<0.001) and toxic control (p<0.05), was observed in combination treatment group, Met+NSO+TSO (Figure 5). Whereas, the highest level of calcium ion was observed in the standard drug treatment group, which was significantly (p<0.01) different from that of the toxic control group and slightly higher than the NC. The levels of magnesium ions were constantly same throughout all the groups with only single significant (p<0.05) variation in the standard drug treatment group, as compared to the NC, it was also the highest recorded level of magnesium in blood serum among all groups (Figure 5). Figure 5: The changes in the levels of calcium, magnesium and phosphorous in various groups. Values are expressed as mean ± SD (n=6). Groups as compared to NC: a(p<0.05), b(p<0.01), c(p<0.001); groups as compared to toxic control p(p<0.05), q(p<0.01), r(p<0.001). Histopathological studies of the section from liver and kidney tissues were also carried out to confirm the outcome of the biochemical serum analysis. The major and significant histopathological revelations of hepatocytes is observed and discussed in Figures 6-8. It can be clearly seen that TAA induced toxicity, in the form of multiple foci of massive centrilobular hepatocytes necrosis, swollen degenerated hepatocytes and nuclear debris mixed with inflammatory cells (Figure 6), was appeased remarkably by the combinational drug therapy of NSO and metformin, approached in this study and it was also considerably better than the monotherapy of these drugs alone. The reparative changes were quite congruent to those of the jigreen group (group 8) as well as the normal control group. Figure 6: Light microphotographs (H&E, 10X on the left side and 40X on the right side) of sections from rat’s liver. G1 and G1’: NC exhibited normal hepatocyte cell palates (black arrows) around central vein (CV). G2 and G2’: toxic control group showed multiple foci of massive centrilobular hepatocytes necrosis (black arrows and square), swollen degenerated hepatocytes (black arrow), and nuclear debris mixed with inflammatory cells (Stars). G3 and G3’: NSO per se group revealed normal hepatocytes cell cord radiating from the CV (single black arrow). The hepatocytes have central euchromatic nuclei and well preserve homogeneous cytoplasm (split arrows), blood sinusoids showed normal lining cells (white arrows). Figure 7: Light microphotographs (H&E, 10X on the left side and 40X on the right side) of sections from rat’s liver. G4 and G4’: metformin per se group showed almost normal hepatocytes radiating from the CV at 10X (white arrow), mild vacuolization can be seen at 40X (black arrow), blood sinusoids showed normal lining cells (white arrow). G5 and G5’: NSO+TAA treated group showed moderate decrease in hepatocyte necrosis regions, but mild congestion (white arrow and square) and degenerative regions can still be spotted (red stars). G6 and G6’: metformin+TAA treated group, exhibited decreased area of necrotic hepatocytes (dotted squares) and showed significant protection from centrilobular necrosis, the hepatic architecture was preserved except few hepatocytes which showed dark cytoplasm (black arrows). Figure 8: Light microphotographs (H&E, 10X on the left side and 40X on the right side) of sections from rat’s liver. G7 and G7’: NSO +metformin+TAA treated group, exposed the normalcy brought about by the novel combination treatment. The entire hepatic architecture appears to be restored (dotted square), the cell cord radiating from the CV appears aligned (white arrow) but slight monocytic infiltration is yet apparent. G8 and G8’: jigreen+TAA treated group, showed less frequent regions of hepatic tissue necrosis (dotted squares). Marked protection of hepatocytes was seen (white arrow) however slight monocytic infiltration was observed. The liver plays important role in the detoxification of variety of toxins, harmful chemicals and drugs; hence liver protects the body from their toxic and unwanted effects. On the other hand, kidneys are equally important organs that help in the elimination of the toxic wastes from the body. Any damage to these vital organs results into the serious consequences. The detoxification capacity of liver significantly declines due to hepatotoxicity, hence other organs of the body may get exposure to several poisons and toxins due to hepatorenal damage. The main objective of the current study was to evaluate the protective and comparative biochemical efficacy of mono drug therapy of metformin and NSO individually, as well as their combination therapy through pre-treatment against thioacetamide (TAA) induced acute liver and kidney damage in rats. This study demonstrated the protective effects of metformin, NSO, and metformin plus NSO on pre-treatment against TAA induces hepatorenal toxicities. The marketed polyherbal hepato-protective formulation “jigreen” was used as the standard reference drug. The biochemical parameters of liver and kidney function tests, some important electrolytes, serum lipid profile and histological changes of these vital organs were investigated. The results are presented in Figures 1 to 5. Single doses of TAA are known to cause centrilobular necrosis of the hepatic lobule and elevation in bilirubin, serum transaminases and other biomarkers. Hence, TAA (500 mg/kg) was administered by intraperitoneal injection to induce acute hepatorenal injury . The enzymatic activities of ALT, AST, GGT, and ALP are the most trustworthy assessments to investigate the liver diseases. ALT is mainly found in the liver and is vastly considered as most sensitive and key biomarker as its activity is directly associated with hepatic injury. However, an increased serum ALT activity is also associated with toxicities of other organs. ALT is a precise indicator of liver damage as compared with AST. Apart from liver, AST is also abundantly present in a number of other tissues e.g. like skeletal muscles, kidneys, heart and brain etc. The serum level of AST is considered another important biomarker of liver damage. Moreover, elevated level of serum GGT activity is also a reliable biomarker of hepato-toxicity. On the other hand, alkaline phosphatase (ALP) found in nearly all tissues of the body, predominantly occurring in the liver and kidney tissues. Therefore, elevated levels of ALP in serum are considered as important biomarker of liver and kidney damage as well. Significant increase in concentrations of serum transaminases is considered as an index of liver damage, cellular leakage and damage of the hepatic cell membrane . This is reported that single dose administration of TAA by intraperitoneal injection causes necrosis in hepatic cells which leads to elevated level of bilirubin and serum transaminases in rats [34,35]. In this protocol, TAA administered rats showed marked increase in kidneys and liver serum enzymes and also altered serum lipid profile. A single dose (500 mg/kg) administration of TAA by intraperitoneal injection in the rats markedly increased the level of serum ALT, AST, ALP, and GGT as compare to rats of normal control group which indicates the liver toxicity (Figures 1 and 2). Our data showed that pre-treatment of TAA intoxicated rats with metformin alone, NSO alone and the combination of metformin and NSO significantly decreased the elevated level of serum AST, ALT, ALP, GGT, T-bilirubin and D-bilirubin towards the normal values. These observations suggested the hepato-protective efficacy of metformin and NSO as monotherapy as well as their combination. Therefore, metformin may promote the phospholipid bilayer membrane stabilization which further leads to cell integrity, and ultimately prevents the cellular leakage of cytoplasmic components and enzymes from the hepatocytes into the blood. The membrane stabilizing property of the metformin will subsequently prevent the necrosis of the hepatic cells [10,13]. The combination of metformin and NSO exhibited synergistic hepato-protective effects. The metformin possibly exerts its protective effects by multiple mechanism of action. The protective effect of metformin is assumed to be via inhibition of apoptosis, mitochondrial dysfunction, oxidative stress, and activation of NF-κb. Since, metformin is positively charged, it enters the mitochondria of hepatocytes and inhibits ATP production. The inhibition of mitochondrial ATP production in turn results into the acute inhibition of gluconeogenesis. The metformin is also reported to suppress liver inflammation by inhibiting interleukin-6-stimulated inflammatory response via activation of AMP-activated protein kinase (AMPK) . The findings in our study agree with data obtained by the Kim et al. . Metformin is also found to significantly decrease the area of centrilobular necrosis. Further, NSO contains a bioactive chemical constituent named, thymoquinone, which is a strong free radical scavenger and acts as an antioxidant. Nigella sativa and thymoquinone are known to possess hepatoprotective effects against different experimental models of hepatotoxicity. N. sativa is also reported to protect several organs like kidneys, liver, lungs, brain, heart and other organs against various chemical toxicants used in animal models . In our study, pre-treatment with NSO also decreased the elevated level of serum AST, ALT, ALP, GGT, T-bilirubin and D-bilirubin towards the normal values (Figures 1 and 2). These findings indicate the hepato-protective effects of NSO alone. The thymoquinone is a well-known pharmacologically active compound of N. sativa. The hepato-protective effects of NSO might be due to antioxidant and membrane stabilizing property of thymoquinone. Similar observations were also reported by some previously published research article by Nehar et al. . The impairment of lipid metabolism is usually found with liver toxicity and liver diseases. Therefore, lipid profiles e.g. TG (mg/dL), TC (mg/dL), HDL-C (mg/dL) and LDL-C (mg/dL), was estimated for the assessment and their correlation with the severity of liver damage. The lipid parameter of TAA intoxicated rats showed a significant increase in the serum level of TG, TC, and LDL-C, while serum level of HDL-C was significantly reduced in comparison rats of NC group (Figure 3). Similar results were also obtained by Kabiri et al. . The pre-treatment with metformin alone, NSO alone, Met+NSO combination and jigreen significantly reduced the elevated level of serum TG, TC, and LDL-C, on the other hand, reduced level of serum HDL-C was significantly increased with the given treatments (Figure 3). Our findings are at par with earlier findings of El-Dakhakhny et al., Abdel-Daim et al. and Al-Seeni et al. [39-41]. These authors established that NSO could significantly decrease the elevated level of serum TG, TC, and LDL-C and restore the decreased level of serum HDL. The level of serum uric acid (mg/dL), urea (mg/dL), creatinine (mg/dL), calcium (mg/dL), magnesium (mg/dL), and phosphorus (mg/dL) were also analysed to investigate the effects of metformin alone, NSO alone, metformin plus NSO combination and jigreen alone on TAA induced nephrotoxicity. It was observed that single dose administration of TAA to the experimental animals significantly increased serum uric acid (mg/dL), urea (mg/dL), creatinine (mg/dL), while there was no significant alteration serum level of calcium (mg/dL), magnesium (mg/dL), and phosphorus (mg/dL) level as compare to the rats of normal control animals (Figures 4 and 5). These changes are clear indication of an acute nephrotoxicity [8,41,42]. Results of current study shows that pre-treatment of animals with NSO alone, metformin alone and co-administration of metformin plus NSO and standard marketed drug jigreen significantly restored the increased level of kidney biochemical parameter towards its normal value. Hence, these findings confirm the protective effects of metformin alone, NSO alone, their combinations and jigreen against TAA induced nephrotoxicity (Figures 4 and 5). 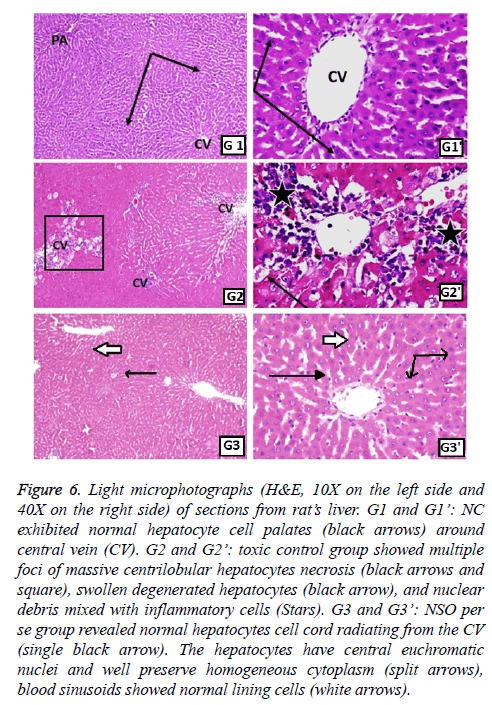 Normal hepatic structure was observed in group 1 rats (NC), as it showed hepatocytes radiating from the central vein (CV) to the circumference of hepatic lobules and arranged in plates and separated by blood sinusoids (Figure 6). Intraperitoneal administration of TAA, induced hepatotoxicity evident in the form of necrosis, sometimes associated with hemorrhage. Hepatocytes in some areas looked miniatured, dark and with small pyknotic nuclei, hence showing the apoptotic character of the hepatocytes. Mononuclear cells were seen infiltrating the blood sinusoids (Figure 6). Administration of monotherapy, i.e., single drug treatment in groups 3-6 (Figures 6 and 7) showed restored architecture of hepatocyte. The histopathological analysis revealed normal hepatocytes cell cord radiating from the CV and the hepatocytes had central euchromatic nuclei well preserved in homogeneous cytoplasm, also the blood sinusoids were found to possess normal lining cells. However, the toxic effect of TAA was still evident in these groups as the characteristic features of toxicity such as mild congestion of hepatocytes, mild vacuolization and partial necrosis of central lobe were present. In the combination treatment group 7, it was seen that near normal features were restituted by the NSO and metformin together (Figure 8). The hepatocytes as well as the sinusoids looked almost like the normal control group. Similar results were apparent from group 8, jigreen treatment group (Figure 8). In the same manner, the histopathological examination of kidneys from toxic control group exhibited darker nuclei of lining epithelium cells, miniatured in size, along with lobulation in glomerular capillaries. Congested capillaries were also observed, and epithelium of the Bowman’s capsule was damaged (Figure 9). These changes were not seen in normal control group and the groups with single drug treatment (Figures 9 and 10). The combination therapy showed remarkable recovery and the renal tubular cells as well as the glomerulus were near normal in group 7. Similar results were obtained in standard drug control group and a complete recovery of renal cells was seen (Figure 11). Figure 9: Light microphotographs (H&E, 10X on the left side and 40X on the right side) of sections from rat’s kidney. G1 and G1’: normal control group showed normal renal corpuscles and glomerulus (black arrows) and renal tubules with normal lining epithelium (white arrow). 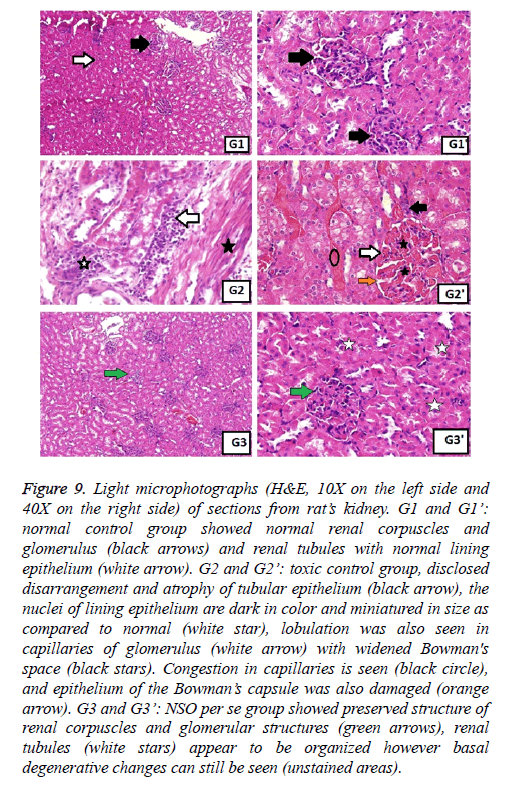 G2 and G2’: toxic control group, disclosed disarrangement and atrophy of tubular epithelium (black arrow), the nuclei of lining epithelium are dark in color and miniatured in size as compared to normal (white star), lobulation was also seen in capillaries of glomerulus (white arrow) with widened Bowman's space (black stars). Congestion in capillaries is seen (black circle), and epithelium of the Bowman’s capsule was also damaged (orange arrow). G3 and G3’: NSO per se group showed preserved structure of renal corpuscles and glomerular structures (green arrows), renal tubules (white stars) appear to be organized however basal degenerative changes can still be seen (unstained areas). Figure 10: Light microphotographs (H&E, 10X on the left side and 40X on the right side) of sections from rat’s kidney. G4 and G4’: metformin per se group appeared near normal and showed preserved renal tubular structure (white arrow) and glomerulus (black arrow). G5 and G5’: NSO+TAA treated group showed moderation of the toxicity with near normal renal architecture (white stars) but capillary congestion is seen (red star). G6 and G6’: metformin+TAA treated group, revealed clearly normal renal structure with protected renal tubules (white stars) and glomerulus (white arrows). Figure 11: Light microphotographs (H&E, 10X on the left side and 40X on the right side) of sections from rat’s kidney. G7 and G7’: NSO +metformin+TAA treated group and G8 and G8’: jigreen+TAA treated group showed completely restituted structure of Bowman’s capsule (white arrows) and renal tubular structure (green stars). The nephroprotective efficacy of metformin, NSO and their combination might be due to multiple mechanism of actions. The metformin, NSO and jigreen exhibit their effects due to their antioxidant, free radical scavenging and membrane stabilizing properties of the kidney tissues. In gross outcomes of this experiment reflects that pre-treatment of the experimental animals with metformin, NSO, and its combination exhibit protective (preventive) activity against TAA mediated hepatic and renal toxicity. The basic mechanism of this protection might be due to its synergistic effect against inflammation and oxidative stress. Furthermore, it is possible that metformin and NSO might exhibit their protective potential against TAA induced hepato-renal toxicity by their immunomodulation activity. Further research required for the establishment of detailed mechanism of action of NSO and metformin for their hepato-renal protective efficacy. Finally, these findings of the undertaken study suggested that co-administration of metformin and Nigella sativa seed oil could be beneficial for the prevention of hepato-renal toxicity, however detailed animal experimental and clinical studies are required to authenticate their use. Our results illuminate novel hepatorenal protective mechanisms of metformin alone and its co-administration with NSO. It is suggested that metformin could be investigated further as a novel prophylactic agent for the prevention of oxidative stress induced hepatorenal toxicities. This project was funded by the Deanship of Scientific Research (DSR), King Abdulaziz University, Jeddah, under grant no. (G-487-156-1437). The authors, therefore, acknowledge with thanks DSR technical and financial support. Ahmad A, Pillai KK, Najmi AK, Ahmad SJ, Pal SN, Balani DK. Evaluation of hepatoprotective potential of jigrine post-treatment against thioacetamide induced hepatic damage. J Ethnopharmacol 2002; 79: 35-41. Amir M, Khan MA, Ahmad S, Akhtar M, Mujeeb M, Ahmad A, Khan SA, Al-Abbasi FA. Ameliorating effects of Tamarindus indica fruit extract on anti-tubercular drugs induced liver toxicity in rats. Nat Prod Res 2016; 30: 715-719. 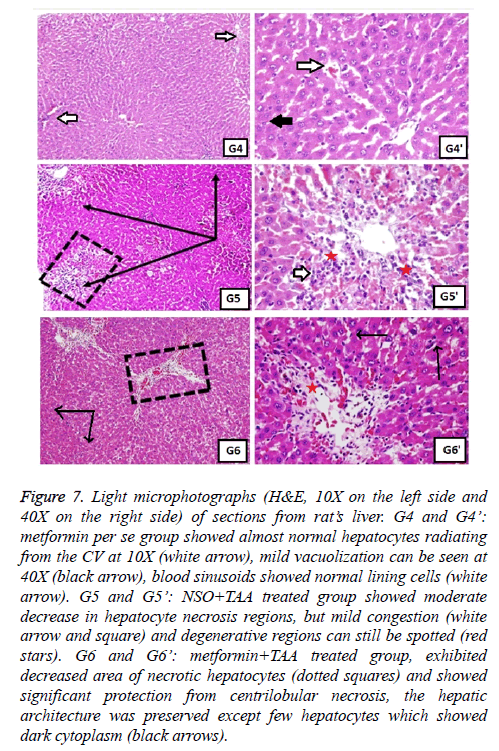 Ghabril M, Chalasani N, Björnsson E. Drug-induced liver injury: a clinical update. Curr Opin Gastroenterol 2010; 26: 222-226. Helmy SA, El-Mesery M, El-Karef A, Eissa LA, El Gayar AM. Chloroquine upregulates TRAIL/TRAILR2 expression and potentiates doxorubicin anti-tumor activity in thioacetamide-induced hepatocellular carcinoma model. Chem Biol Interact 2018; 279: 84-94. Chen TM, Subeq YM, Lee RP, Chiou TW, Hsu BG. Single dose intravenous thioacetamide administration as a model of acute liver damage in rats. Int J Exp Path 2008; 89: 223-231. Aftab A, Pillai KK, Shibli JA, Balani DK, Najmi AK, Marwah R , Hameed A. Evaluation of the hepatoprotective potential of jigrine pre-treatment on thioacetamide induced liver damage in rats. Indian J Pharmacol 1999; 3: 416-421. Lee J, Homma T, Fujii J. Mice in the early stage of liver steatosis caused by a high fat diet are resistant to thioacetamide-induced hepatotoxicity and oxidative stress. Toxicol Lett 2017; 277: 92-103. Al-Attar AM, Alrobai AA, Almalki DA. Protective effect of olive and juniper leaves extracts on nephrotoxicity induced by thioacetamide in male mice. Saudi J Biol Sci 2017; 24: 15-22. Kim YH, Hwang JH, Kim KS, Noh JR, Choi DH, Kim DK, Tadi S, Yim YH, Choi HS, Lee CH. Metformin ameliorates acetaminophen hepatotoxicity via Gadd45β-dependent regulation of JNK signaling in mice. J Hepatol 2015; 63: 75-82. Saeedi Saravi SS, Hasanvand A, Shahkarami K, Dehpour AR. The protective potential of metformin against acetaminophen-induced hepatotoxicity in BALB/C mice. Pharm Biol 2016; 54: 2830-2837. Horiuchi T, Sakata N, Narumi Y, Kimura T, Hayashi T, Nagano K, Liu K, Nishibori M, Tsukita S, Yamada T, Katagiri H, Shirakawa R, Horiuchi H. Metformin directly binds the alarmin HMGB1 and inhibits its proinflammatory activity. J Biol Chem 2017; 292: 8436-8446. Thomas I, Gregg B. Metformin; a review of its history and future: from lilac to longevity. Pediatr Diabetes 2017; 18: 10-16. Hadi NR, Al-Amran FG, Swadi A. Metformin ameliorates methotrexate-induced hepatotoxicity. J Pharmacol Pharmacother 2012; 3: 248-253. Mansour HH, El Kiki SM, Galal SM. Metformin and low dose radiation modulates cisplatin-induced oxidative injury in rat via PPAR-γ and MAPK pathways. Arch Biochem Biophys 2017; 616: 13-19. Du K, Ramachandran A, Weemhoff JL, Chavan H, Xie Y, Krishnamurthy P, Jaeschke H. Editors highlight: metformin protects against acetaminophen hepatotoxicity by attenuation of mitochondrial oxidant stress and dysfunction. Toxicol Sci 2016; 154: 214-226. Borole KD, Bodhankar SL, Dawane JS, Kanwal JK. Hepatorenal repercussions of alcoholic exposure in a rat model: a dose-dependent study of metformin intervention. Iran Biomed J 2012; 16: 101-106. Hashmi T. Probable hepatotoxicity associated with the use of metformin in type 2 diabetes. BMJ Case Rep 2011; 2011. Abu-Darwish MS, Efferth T. Medicinal plants from near East for cancer therapy. Front Pharmacol 2018; 9: 56. Abdel-Zaher AO, Abdel-Rahman MS, Elwasei FM. Protective effect of Nigella sativa oil against tramadol-induced tolerance and dependence in mice: role of nitric oxide and oxidative stress. Neurotoxicology 2011; 32: 725-733. Abel-Salam BK. Immunomodulatory effects of black seeds and garlic on alloxan-induced diabetes in albino rat. Allergol Immunopathol (Madr) 2012; 40: 336-340. Ahmad A, Husain A, Mujeeb M, Khan SA, Najmi AK, Siddique NA, Damanhouri ZA, Anwar F. A review on therapeutic potential of Nigella sativa: A miracle herb. Asian Pac J Trop Biomed 2013; 3: 337-352. Ahmad A, Husain A, Mujeeb M, Siddiqui NA, Damanhouri ZA, Bhandari A. Physicochemical and phytochemical standardization with HPTLC fingerprinting of Nigella sativa L. seeds. Pak J Pharm Sci 2014; 27: 1175-1182. Al-Suhaimi EA. Hepatoprotective and immunological functions of Nigella sativa seed oil against hypervitaminosis A in adult male rats. Int J Vitam Nutr Res 2012; 82: 288-297. Ali M, Khan T, Fatima K, Ali QUA, Ovais M, Khalil AT, Ullah I, Raza A, Shinwari ZK, Idrees M. Selected hepatoprotective herbal medicines: Evidence from ethnomedicinal applications, animal models, and possible mechanism of actions. Phytother Res 2018; 32: 199-215. Urfi MK, Mujahid M, Rahman MA, Rahman MA. The role of Tamarix gallica leaves extract in liver injury induced by rifampicin plus isoniazid in Sprague Dawley rats. J Diet Suppl 2018; 15: 24-33. Liu FP, Ma X, Li MM, Li Z, Han Q, Li R, Li CW, Chang YC, Zhao CW, Lin YX. Hepatoprotective effects of Solanum nigrum against ethanol-induced injury in primary hepatocytes and mice with analysis of glutathione S-transferase A1. J Chin Med Assoc 2016; 79: 65-71. Rao GM, Rao CV, Pushpangadan P, Shirwaikar A. Hepatoprotective effects of rubiadin, a major constituent of Rubia cordifolia Linn. J Ethnopharmacol 2006; 103: 484-490. Ibrahim M, Khaja MN, Aara A, Khan AA, Habeeb MA, Devi YP, Narasu ML, Habibullah CM. Hepatoprotective activity of Sapindus mukorossi and Rheum emodi extracts: in vitro and in vivo studies. World J Gastroenterol 2008; 14: 2566-2571. Ahmad A, Al-Abbasi FA, Sadath S, Ali SS, Abuzinadah MF, Alhadrami HA, Mohammad Alghamdi AAM, Aseeri AH, Khan SA, Husain A. Ameliorative effect of camels milk and Nigella sativa oil against thioacetamide-induced hepatorenal damage in rats. Pharmacogn Mag 2018; 14: 27-35. Hassan MQ, Akhtar M, Ahmed S, Ahmad A, Najmi AK. Nigella sativa protects against isoproterenol-induced myocardial infarction by alleviating oxidative stress, biochemical alterations and histological damage. Asian Pac J Trop Biomed 2017; 7: 294-299. Wang YW, He SJ, Feng X, Cheng J, Luo YT, Tian L, Huang Q. Metformin: a review of its potential indications. Drug Des Devel Ther 2017; 11: 2421-2429. Bekpinar S, Vardagli D, Unlucerci Y, Can A, Uysal M, Gurdol F. Effect of rosiglitazone on asymmetric dimethyl arginine metabolism in thioacetamide-induced acute liver injury. Pathophysiology 2015; 22: 153-157. Mujeeb M, Khan SA, Aeri V, Ali B. Hepatoprotective activity of the ethanolic extract of Ficus carica Linn. leaves in carbon tetrachloride-induced hepatotoxicity in rats. Iranian J Pharm Res 2011; 10: 301-306. Hajovsky H, Hu G, Koen Y, Sarma D, Cui W, Moore DS, Staudinger JL, Hanzlik RP. Metabolism and toxicity of thioacetamide and thioacetamide S-oxide in rat hepatocytes. Chem Res Toxicol 2012; 25: 1955-1963. Koen YM, Sarma D, Hajovsky H, Galeva NA, Williams TD, Staudinger JL, Hanzlik RP. Protein targets of thioacetamide metabolites in rat hepatocytes. Chem Res Toxicol 2013; 26: 564-574. Nehar S, Kumari M. Ameliorating effect of Nigella sativa oil in thioacetamide-induced liver cirrhosis in albino rats. Indian J Pharma Edu Res 2013; 47: 135-139. Kabiri N, Darabi MA, Rafieian-Kopaei M, Setorki M, Doudi M. Protective effect of Kombucha tea on liver damage induced by thioacetamide in rats. J Bio Sci 2014; 14: 343-348. El-Dakhakhny M, Mady NI, Halim MA. Nigella sativa L. oil protects against induced hepatotoxicity and improves serum lipid profile in rats. Arzneimittel-Forschung 2000; 50: 832-836. Abdel-Daim MM, Ghazy EW. Effects of Nigella sativa oil and ascorbic acid against oxytetracycline-induced hepato-renal toxicity in rabbits. Iran J Basic Med Sci 2015; 18: 221-227. Al-Seeni MN, El Rabey HA, Zamzami MA, Alnefayee AM. The hepatoprotective activity of olive oil and Nigella sativa oil against CCl4 induced hepatotoxicity in male rats. BMC Compl Alt Med 2016; 16: 438. Abdelaziz RR, Elkashef WF, Said E. Tranilast reduces serum IL-6 and IL-13 and protects against thioacetamide-induced acute liver injury and hepatic encephalopathy. Environ Toxicol Pharmacol 2015; 40: 259-267.